Digital C-print, 26 x 26 cm [10 1/4 x 10 1/4 in. ], edition of 10. Jian-Xing Too was one of the artists in the exhibition/window display “The Full White Cube/Le cube blanc plein” and “Reddish Green” is the title of the piece she showed. Two days after the show opened, this piece was destroyed by a brick thrown through the window. Rather than remaking the broken piece, the artist decided to replace it with a new work made with the brick. 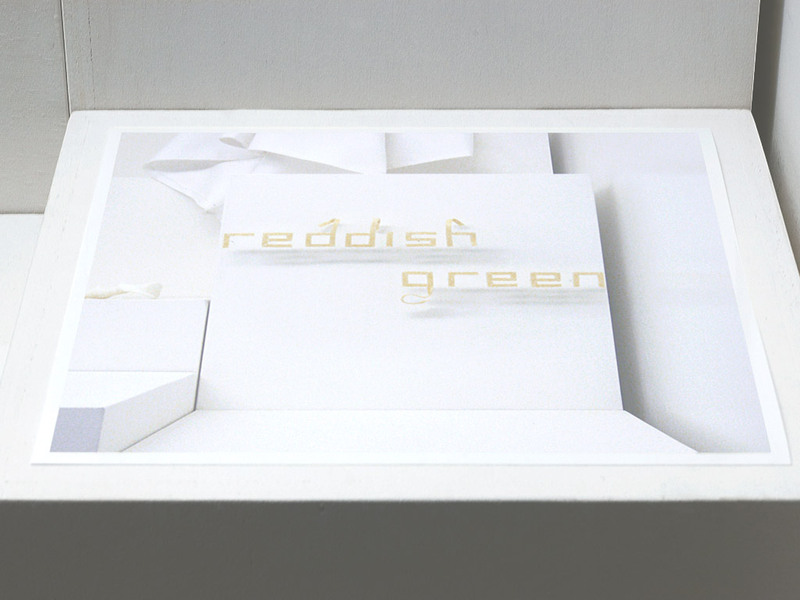 I had taken a photograph of “Reddish Green” before it was destroyed, and this picture is the only existing document showing “Reddish Green” in the context of the exhibition. Wanting to reintroduce this document in the same context, I proposed to exhibit as my own work a print of it in the window, in place of a multiple by John Armleder, which was also broken but not replaced. This photographic edition is entitled with the artist’s name, the title of her piece, and the date of the photograph.